The holidays are coming – time to host family and friends, often for a big meal. 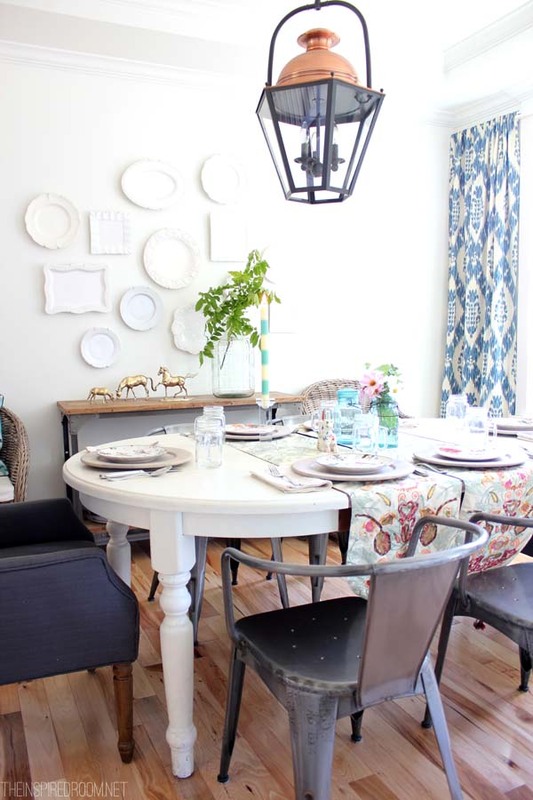 Is your dining room ready to handle the guests? Want to spice it up a bit? 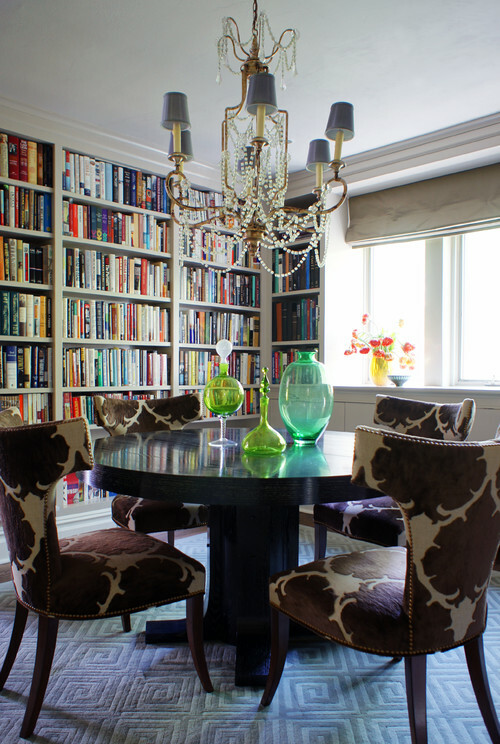 Here are some tips for making your dining room feel grand. Of course, that sky mural on the ceiling doesn’t hurt, either! Wow! You don’t need crystals to make a grand statement with lighting in a dining room. I love how this big lantern warms up this dining room by adding earthy tones and materials. To make a dining room feel grand, add architectural elements, like trim or wainscoting. Adding bold pops of color makes a room feel grand, especially when the color is rich and saturated. The green provides a richness in contrast to the neutrals of the furniture and rug. 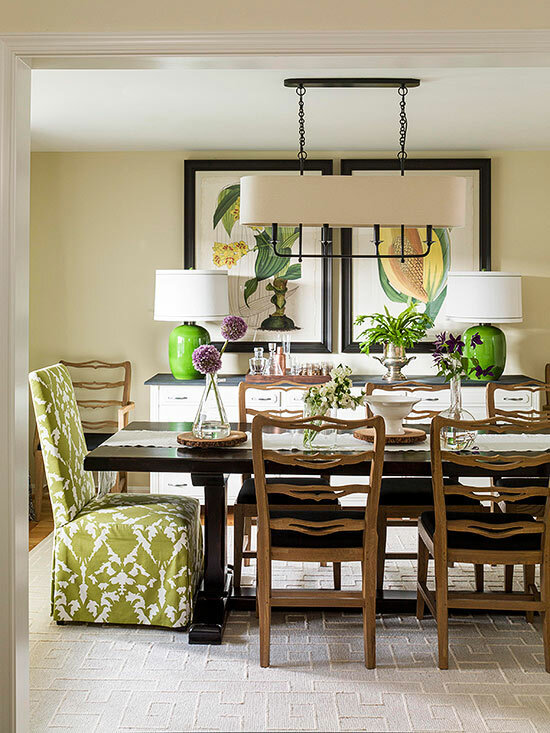 This dining room shows that grand need not mean “traditional.” The green buffet makes a big statement in this room, while still being eclectic and more contemporary. 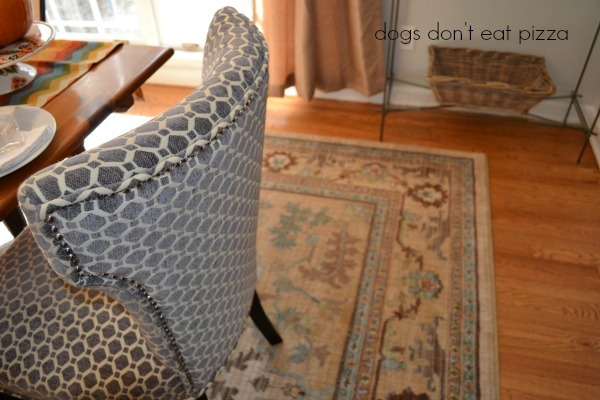 Adding a beautiful rug to your dining room can give the room a grand feel, too. The rug warms up the floor and makes the room feel finished. 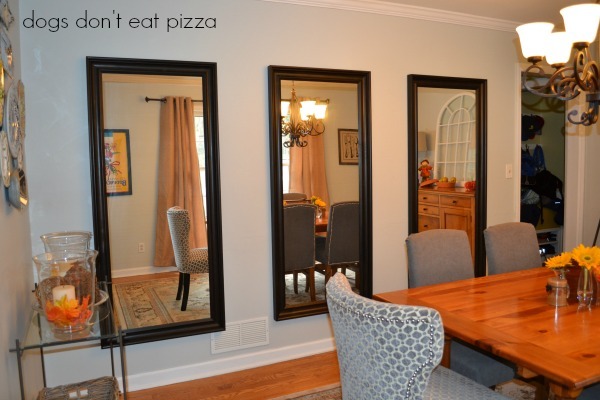 Using three tall mirrors not only creates more light in the dining room (reflecting the light from the opposite window), but gives a grand feel to an otherwise boring wall. The chunky wood frames of the mirrors provide weight and substance to them. And three of them are more dramatic than using just one. 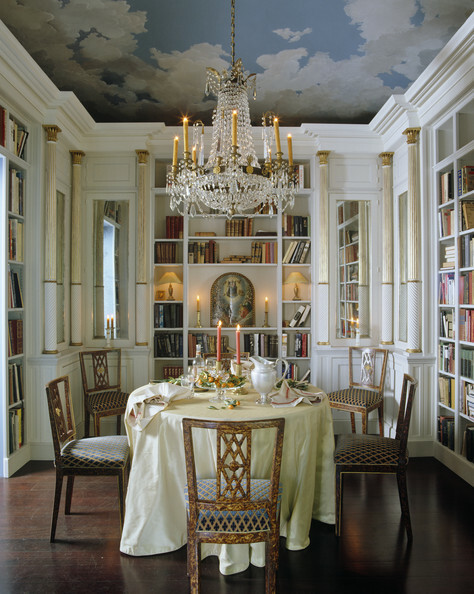 How do you like to create a grand feel in your dining room? Fun post, Karen. Lots of ideas to consider. Our dining room is really just a space at the end of our kitchen, which is all open into other living areas. There is one fantastic wall, vaulting up to the ceiling peak, and that’s always a very bold color statement. We have two favorite art pieces and area rugs that take turns there. 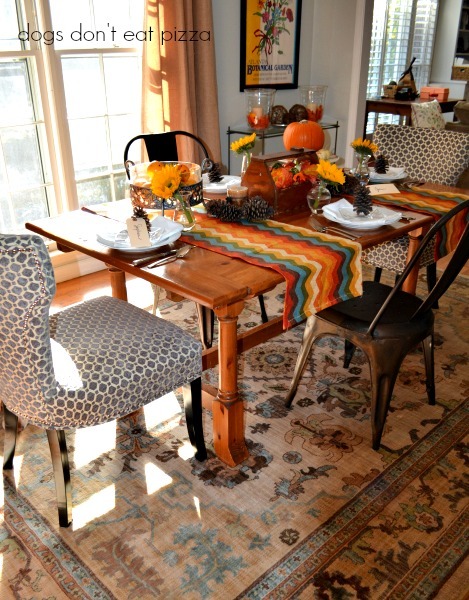 The main way I change the dining area, is to add or remove the table leaf, going from rectangular to square, and then angling the rug and table in different directions. And of course, having fun with the table centerpieces! Cheryl, I love how you change it up, and how you accent the big wall with art. Great ideas!